Our Mission: Maximize your returns using our retail market focus paired with the most competitive commission structure in the industry. Reputation: Reputation for integrity and fair dealing with a simple and transparent fixed-cost sales model to achieve win-win transactions for both the seller and buyer - resulting in loyal and repeat customer/consignor base. Expertise: Author of The Definitive Resource for Liberty Seated Dime Variety Collectors, President of the Liberty Seated Collectors Club, and coin hobbyist and researcher since 1989. Over this time, Gerry has racked up over 10,000 hours reviewing coins, the benchmark made popular by Malcolm Gladwell for acquiring mastery. Business Model: Focused on providing consignors with the highest net return possible. On average, GFRC pays out more than 90% (see above) of the all-in sale price - unmatched in the industry. Gerry's manufacturing and operations background in the semiconductor industry has enabled GFRC to operate successfully with a low cost structure and consignor-friendly margins. Customer Base: Gerry's Daily Blog is read by over 500 customers daily searching for quality offerings resulting in many same day sales. Transparency: All business activities are tracked within GFRC's unique Consignor-Oriented Inventory of Numismatics (COIN) system. COIN summarizes consignor activities including consigned inventories, pieces sold and bought, commission and purchase payments, and a financial account summary, in an easy to read PDF format. Below is an example of the COIN consignor report. Visibility: Consignor coins are listed on GFRC website in an industry leading collector-friendly viewing format that includes auction-grade descriptions, grading (for raw coins) and variety attribution PLUS potential spotlight in the Daily Blog. The GFRC website averages over 500 unique visitors daily with a higher Alexa rank than its competitors excluding auction sites (e.g., Heritage, Great Collections and DLRC). Coin Show Presence: GFRC takes tables at approximately 15 shows annually covering all regions of the United States as well as internationally in China. Photography: In contrast to nearly all other dealers, GFRC utilizes natural sunlight for all photographs resulting in a more accurate representation for color and grade verification. Excellent photographs are critical to selling coins online. In building The Definitive Resource for Liberty Seated Dime Variety Collectors, Gerry has gained decades of experience in the art of photographing coins. Gallery Spotlight: consignors with over 20 coins or aggregate value over $20,000 receives their own Consignor Gallery. At GFRC, your prized collection is featured in an online gallery for the entire numismatic community to enjoy today and for years to come. Trading Desk: Implemented to simplify the process of acquiring quality coins, consignors can purchase new coins using accumulated consignment credit. 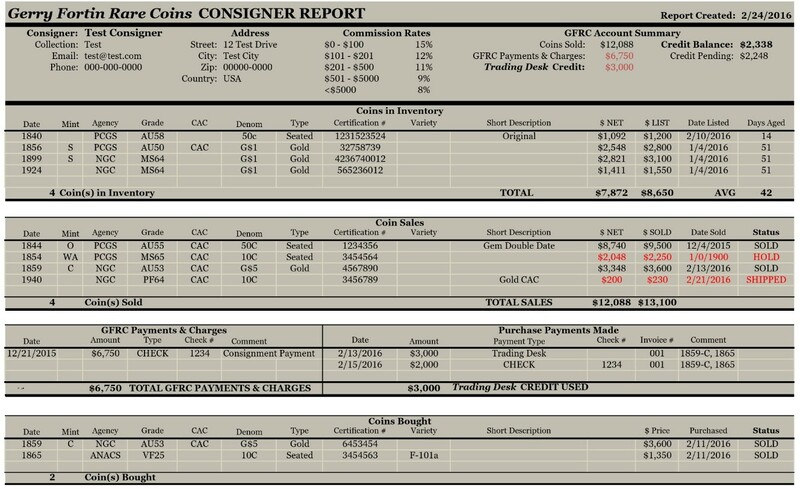 Trading Desk credits and purchases are itemized within each consignor's COIN system report. Consignor Ownership: Unlike competitors, consignors retain control of pricing and discounting to suit consignor's individual needs and risk appetite. Gerry will periodically provide suggestive pricing adjustments in-line with market conditions, but the consignor is under no obligation to deviate. Value-based Pricing: The GFRC approach to generating pricing recommendations for all new consignments goes beyond popular price guides such as PCGS, GreySheet, or Coin World Values. Instead, individual coin values are retail sale prices are established by using the GFRC Quality Rating System and base lining against auction records. The goal of value-based pricing is to balance maximizing consignor return while minimizing time to sell. Minimum Value: Unless part of a more substantial consignment, the minimum value per coin is $100. Coinage Wanted: GFRC is primarily accepting quality Bust, Liberty Seated, and United States Gold coinage. However, other types may be accepted based on GFRC clientele and market conditions. Please inquire concerning your holdings as GFRC strives to work with collectors attempting divestment of quality numismatic properties. Return Policy: Consignors may at any time request the partial and/or full return of a consignment. For return requests within 120 days of receipt by GFRC, there will be a 3% early return fee on the previously agreed upon aggregate sale price to recover photography, listing and marketing efforts. This fee + return shipping is due prior to return shipment. Return shipping cost will be the responsibility of the consignor. All returns will be shipped within 5 days of consignor account settlement. GFRC reserves the right to reject any consignment offers without reason or cause. GFRC also reserves the right to return any and all consignments without notice or cause. Shipping costs for consignments returned at GFRC's discretion will be paid for by GFRC. All consigned coins are fully insured upon receipt by GFRC's insurance policy. GFRC currently employs the well-recognized Hugh Woods firm for business insurance. GFRC shall have the leadership role with respect to advertising and promoting the coins on the website and numismatic publications, including, but not limited to, photographing or describing the coin. Inputs from consignors towards improving the marketing process are welcomed. All photographs taken by GFRC are the exclusive property of GFRC and shall not be reproduced or used in any manner without the express written permission of GFRC. GFRC has the exclusive rights to market and sell consigned coins during the agreed upon consignment timeframe. By requesting consignment with GFRC, consignor implies agreement with all parts of this Policy. Violation of this Policy may result in the return of all consigned coins with the consignor responsible for return shipping costs. Combination GFRC buying/consignment deals are also available for those looking for upfront cash. Contact Gerry: Please email us using this Pre-formatted Email, which provides consignment detail prompts to understand your numismatic properties. You may also call us at: +1 207-329-9957. Listing all coin(s) at this stage is welcomed, but not required. We will contact you as soon as our schedule allows (typically within 24 to 48 hours) . Based on this information and subsequent follow-up discussion, we will collectively decide on consignment acceptance. Sometimes, GFRC will only accept a portion of the proposed consignment given our 19th Century product emphasis and quality requirements. For example, GFRC will not take common date untoned MS63 - MS66 Morgans on consignment given our emphasis is limited to dual side toners and circulated rare dates. Package and Mail Consignment: All consignments requests must be approved prior to mailing to GFRC. Include a packing list with the consigned coins. When shipping by Registered U.S. Mail, insure the package for an amount that you are comfortable with. GFRC can also provide USPS shipping labels (PDF file) so that your coins will be covered by GFRC insurance while in transit. GFRC generated shipping labels and costs will be posted to your account. We will contact you the day that the package is received and confirm arrival (unless traveling). GFRC Review: Upon receipt we will review the shipment to check the presence of shipped coins against the packaged inventory list. We will also conduct an initial marketability assessment and add your coins to the GFRC's COIN system database. A report will be sent within 3 business days of receipt to document your coins are contained within GFRC inventory and insured. Consensus Pricing Agreement: A subsequent variety attribution, quality and pricing review will be generated with retail pricing recommendations. For smaller consignments of 10 coins of less, the initial report will also contain pricing recommendations. For larger consignments, a separate review for retail pricing will follow shortly after the initial report documenting receipt. Our goal is to provide a full evaluation and retail pricing review within 7 business days of receipt (unless traveling). Consignors can buy-off GFRC's recommended pricing or make adjustments. Working with GFRC is a consensus process until both parties are comfortable with the consignment sales strategy. Listing: Upon retail pricing approval, we will list the consignment on the website in all applicable price lists plus the 30 Day New Purchases and Consignment Price List. Where applicable, a new Consignor Gallery will be generated and posted. If pricing changes are desire after listing, please email us with the coin and new price. Settlement: Great news - One of your coins sold! Payment for sold coins will be issued after the sale is accepted by GFRC customer. Sales are considered final after expiration of the return policy (e.g., purchased at a Coin Show or 10 days after buyer receipt). Payments are made on request or consistent with a previously agreed to credit dollar amount. Payment will be offset by all outstanding account balances (coins purchased from GFRC) due on the day of payment. Consignors may request full or partial payment depending on planned utilization of the Trading Desk program. Consignment Status: Consignor may request their COIN consignor report at anytime.